Chattanooga 2018 is finally here! A new year offers us a new start in many ways. Dental insurance is one that is always fresh in our minds; you get a new insurance maximum. What that means is if you used your dental insurance last year, or maybe maxed it out. In January most dental plans give a new maximum! With a new year brings new opportunities and exciting new things. The economy continues to improve, and stock markets are doing well. The car dealerships around our dental practice on Shallowford Road report record sales. 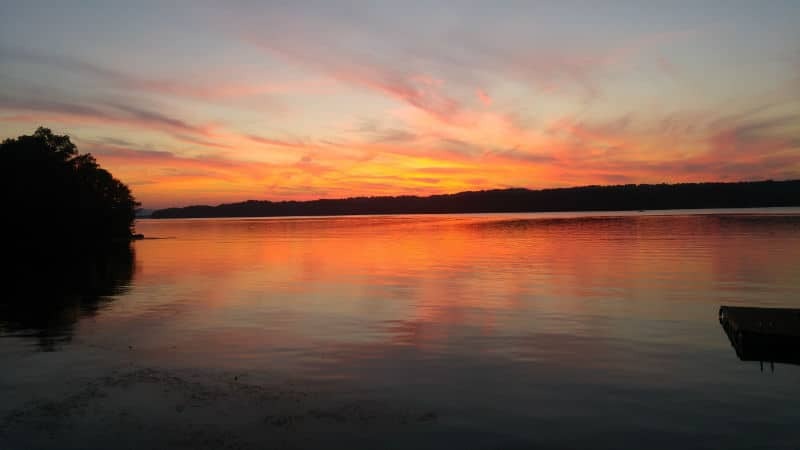 Homes in Chattanooga are selling well. Chattanooga once one of the most polluted cities in the world is now one of the cleanest, and we continue to attract attention for our outdoor activities. The state of Tennessee has one of the best economies in the country. Tennessee schools have been #1 in improved scores for the last two years. The state has a 2 billion dollar surplus. We are living in good times by many measures. This past year has been an amazing one there has never been a year where we have had so many high, highs and so many low lows. Life is very interesting, and it keeps on going. The year started off great. Our practice has never been busier. 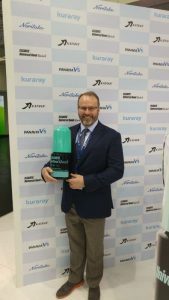 Dr. McOmie did the worldwide launch of a new and innovative dental bonding agent to dentists from not only here in Chattanooga but across the globe. The bonding agent is called Universal Bond Quick and is an innovative product that has created a new category of bonding agent. Using unique chemistry, it delivers a stronger bond much faster. He did a worldwide webinar and had attendees from places like Qatar, Brazil, Istanbul, Greece, Israel, Germany, Alabama, Russia, Abu Dabi, Hawaii, Taiwan, Japan. 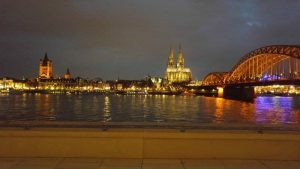 Dr. Mark McOmie was able to go to the worlds largest dental conference in Cologne, Germany. Dr. Mark McOmie with his favorite bonding agent. 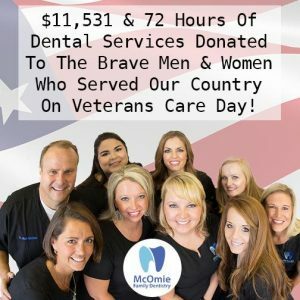 We learned so much at that dental conference and brought it back to Chattanooga, Tennessee, for the benefit of the patients of McOmie Family Dentistry. We were able to implement many dental products and procedures that are state of the art from the things that we learned at this meeting. 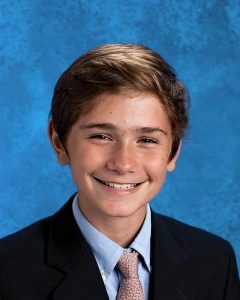 With the loss of Dr. Mark and Dr. Ellen’s nephew Jackson we learned how much our patients, friends and the Chattanooga community supports each other. The outpouring of love from those surrounding our dentists was tremendous. It was an unbelievable warm blanket of love and support that really caught all of us here at McOmie Family Dentistry by surprise. We appreciate each and every person that showed support during that most difficult of times. The Dr.’s McOmie traveled to Germany, Canada, Utah, Georgia, New York, Arizona all to learn more about dentistry. They spent many days learning about new procedures, new materials and how to use them the most effective ways. Our dentists feel by learning from others we can bring world-class dentistry to Chattanooga. If we stay home and never change things will be the way they have always been. Dentistry can be better every year. 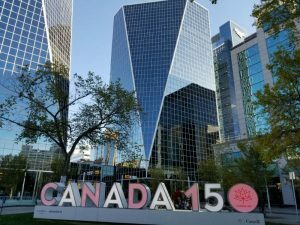 We can do things more efficiently, better, faster and easier. These changes benefit our patients with much better dentistry and at lower prices. Today we do dentistry better then it has ever been done. That sounds like a normal thing to say, but it wasn’t always so. There have been periods like the 1970’s when dentistry’s quality took a hit in favor of cheaper restorations that didn’t last as long. That is no longer the case. Dentistry has quality and now has beauty to match, it is truly at the junction of science, technology, and art. 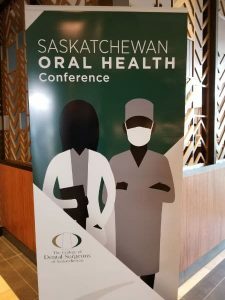 Dr. McOmie attended and spoke at the Saskatchewan Oral Health Conference in Regina, Saskatchewan, Canada. We learned about Paltop Implants! One of the things we learn especially with international travel is that we are not alone. What is meant by this is that we aren’t the only country that does high-level dentistry. Yes, we are the best in many ways, but we have learned that Israel leads the world in dental implants. Who knew? In the US we have a handful of choices of implant companies to choose from. In Israel they have over 100 options, this makes competition stiff. The result of this competition among implant companies is better implants. 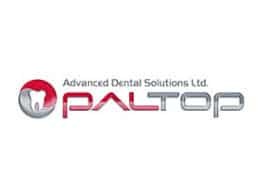 Paltop is the best implant in the world and has been used all over the world for years. They are new to the US market, and we are among the lucky practices to have these advanced implants. Since adopting these implants we see better stability, making implants more predictable and faster to be restored. The restorative platform Dr. McOmie says is the best he has ever seen. We feel fortunate to have such wonderful implants in our practice for our patient’s benefit. Implants and the crowns that go on them have come a long way in the last five years! Moving Forward In 2018, McOmie Family Dentistry’s 20th Year!!! 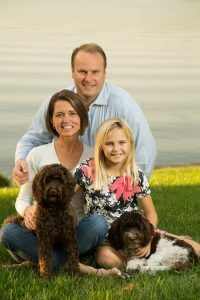 Dr. Ellen McOmie, Dr. Mark McOmie, their daughter Claire and their two dogs Rascal and Alta. We look forward to bringing the latest in dental technology to Chattanooga. We know we are leaders in dentistry that others follow and by doing this, we give our patients the latest in dental care that is higher quality. We want to keep positive changes moving forward. Being nice and providing exceptional service to our patients is our #1 priority. We will continue to be the place when you have a dental problem be it injury, pain, a broken tooth or just a check-up that you can call. We will get you into our office in a timely manner and treat you with respect doing the best care that you could get anywhere in the world. We know this is not an easy task, but it is one that we are and have been dedicated to delivering. Don’t forget that we can all make positive changes in our lives any time of the year! Keep things in perspective and don’t worry about the small things in your life that stress you out. Watch this video from 20 years ago that still applies today. It brings a perspective about things. We’ve shared our resolutions, but we’d love to hear what yours are! Studies have shown 80% of New Year’s resolutions fail by February, so let’s all help each other stick to our goals this year! We wish all our patients a wonderful year! 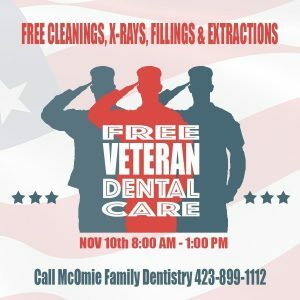 Give us a call to make an appointment McOmie Family Dentistry 423-899-1112.